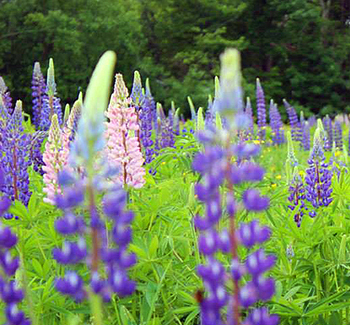 Every year Sugar Hill and surrounding areas celebrate the season of Lupine! For about a month you can see the lupine flower blooming all over northern NH. The highlight of the season is an open air market in Sugar Hill, New Hampshire! This market features local artisans and crafters selling their wares and putting on demonstrations! There are also several bands and musical performances throughout the weekend, as well as educational talks and events to ensure there is something for everyone attending the market! ​The market is located right on Main Street, Sugar Hill- on the lawns of our library and meeting house, with several local businesses and our town history museum close by- you can come get to know Sugar Hill, as well! More events are currently being planned! This event requires many volunteers and donations! If you are interested in volunteering or donating please email us! If you are interested in being a vendor- please look download an application from our Vendor information page!